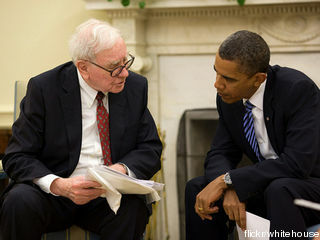 Billionaire investor Warren Buffet (and Omaha native!) said in an interview with Politico yesterday that he would vote for President Obama again if given the chance. "I'd vote for him all over again. ... I think he's got the same vision about America I do. ... I think he has the same social goals, very much, that I do." He then commented on the recent tax debate, and said that, once again, he sides with the President, "I think there should be tax increases for people in the high income levels." He also supports lowering taxes for the middle class, "[it's] almost a cinch that they will be extended for the people - I don't know if it'll be exactly [making less than] $250,000, or whatever the number may be, in the end." So, let's put to rest the idea that raising taxes on the top 2% to the levels from the 1990s will kill job creation. In fact, the greatest time for job creation in the modern era was during the presidency of Bill Clinton after he raised the taxes on the rich modestly. Republicans and their allies on Wall Street whined, yet we had an amazing run in the 90s. Then, of course, came the tax cut and war scheme of George W Bush and we have what we have now. I can only assume that dementia has set in on poor ol' Buffet. Right. Because anyone who doesn't agree with the screaming, rabid tea bagger brigade must be suffering from dementia. Or is it that people who make only 40 billion a year really aren't "rich" and so he deserves another tax cut. I think that is actually the real teabaggers believe. I wish I was one of those evil rich billionares so I could have more to complain about then! lol.